Giny Vos, Traveling Sand, 2008. For the completely redesigned station square in Apeldoorn, visual artist Giny Vos has developed the permanent work Traveling Sand. 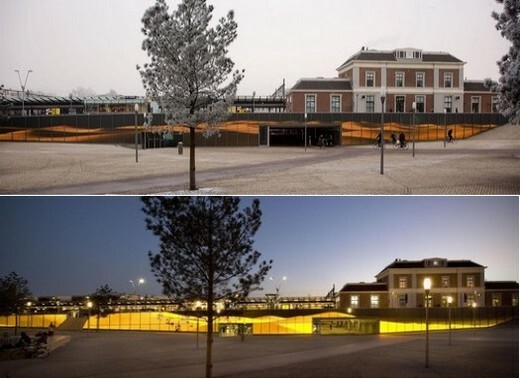 The artwork consists of a 100-metre long, 4-meter high glass wall marking the border between the station square and the platforms. The station square is a transfer node that testifies to the usual information overload of text and image. Vos chose a different approach, in order to create silence and emptiness by representing a windblown movement. More then 1.3 million LEDs behind the etched glass of the wall create a constantly shifting three-dimensional landscape of sand dunes that are whipped up by an invisible wind. The blowing sand creates different, constantly changing patterns of movement ranging from a heavy sand storm to a soft breeze, or even complete tranquility. For Traveling Sand, Vos collaborated with Bram Verhavert and designed a special program that controls the LEDs in order to create this particular choreography of sand. Right in the heart of the city, an image comes into being, dynamic and still at the same time. Since 1985, Giny Vos has been working as a visual artist realizing a number of works in public spaces featuring movement in the form of light or digital displays. Using the specific environment as a point of departure, Vos tries to shed light on the environment by enhancing physical elements or processes that would otherwise remain unnoticed. At the same time, the work also always tells its own story, and thereby enlarges the world: a new situation arises, without the existing one being obscured.